This fast (30 ppm), compact printer is ideal for home office / small business use. HP 2420N comes standard with 32 MB RAM, one 250-sheet tray, and a network card. 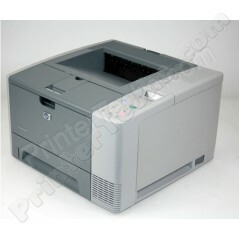 Out of stock -- order the LaserJet 2420DN or 2430DN instead. Call us with any questions at 866-352-7108. The HP 2420N is a fast, compact printer ideal for home office / small business use. This printer comes standard with 32 MB RAM, one 250-sheet tray, and a JetDirect card for connecting to a network. Print speed is rated at 30 pages per minute. 16.7" x 15.7" x 10.2"